Small stream pesca mosca Valsesiana wasn't quite what I expected it to be. It was better - much better. The impression I had gotten of pesca mosca Valsesiana, the Italian fly fishing technique similar to tenkara that uses a stiffer rod, longer horsehair line and a cast of four reverse hackled flies very similar to sakasa kebari, was that it was best suited for larger streams. Pesca mosca Valsesiana is fine for smaller streams - you just use three flies at a time instead of four (on a particularly small stream perhaps only two). Since I had lost all my Valsesian flies to trees very quickly on the first day I tried it on a trout stream, I had mixed feelings about trying on an even smaller stream. I tried it out on a stream that is small enough I usually fish it with an 11' rod. At the time I had thought it much too small for the 13'+ rod that I had previously used for pesca mosca Valsesiana. 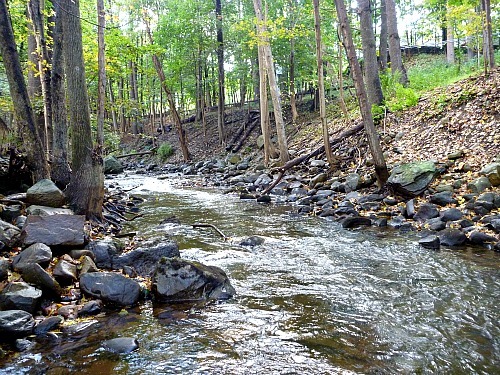 (I have since learned that I can use the long rod, short line technique on smaller streams than I would have imagined.) As a compromise, I used a 360 rod and the size 4 Sunline Hi-Vis Fluorocarbon line instead of a heavy horsehair pesca mosca Valsesiana line. I also had some new flies. I was as ready to try small stream pesca mosca Valsesiana as I was going to be. One of the authentic Valsesian flies that Andrea sent me is tied with a blue thread body. 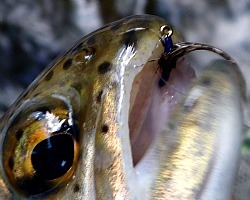 He also mentioned one time that the trout on a recent fishing trip particularly liked the blue fly. I have occasionally wondered why there were no blue flies. Well, there are in Valsesia, and what's more, they work. I had gotten some Royal Blue UNI-Thread to try after I had been told that blue flies were used in pesca mosca Valsesiana (Pearsall's Gossamer silk thread no longer comes in blue although I have since acquired some and now tie my blue flies with blue silk), but for quite a while I hadn't tied any flies with it. I finally tied two, and fished with one. It wasn't very long at all before I caught a feisty 12" rainbow that just would not stay still long enough to have his picture taken. I wanted to take a picture showing the blue fly in it's jaw, but with one last flip the fish was gone and so was the fly. I held the other in reserve so I could at least take a picture. I don't really know why there aren't blue flies. It can't be just that mayflies aren't blue. 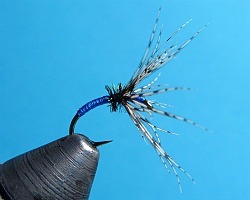 After all, the Snipe and Purple is one of the classic North Country soft hackle flies, and mayflies aren't purple either. 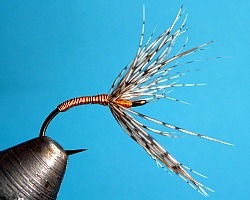 The sakasa copperbari is also a fly I used as one of my three flies. Sakasa copperbari is a tongue-in-cheek name I gave to a fly that Laurent Marshall had written about in one of the posts on his blog. Similar in concept to the extremely popular and productive Copper John, it is a sakasa kebari with a copper wire body for a little extra weight and flash for when you want to fish a little deeper or when the water is a bit high and off color. In the deeper pools it proved to be very effective. Different trout, different fly, same color! pThe Sakasa Kebari Blue and the Sakasa Copperbari will put fish on your line. On the day I fished them, both the Sakasa Kebari Blue and the Sakasa Copperbari did well for me, and contributed to what was the best day I've ever had on that stream, by far, both in terms of number of fish and also size of fish.